Christmas morning a fine one. The boys began to take their Christmas last night. A good deal of drunkenness in camp. In the morning the captain gave us a treat of egg nogg. One-half the boys very tight by nine o’clock…Never saw so many drunk men before. It might be said with propriety that the 7th regiment was drunk on the 25th. Wednesday, Dec. 25, 1862. Camp near Manassas. Pleasant weather. Since we do not have a chaplain, this morning we held a hymn-service instead. I enjoyed the music – reminded me of Papa’s and Edward’s singing at home. I enjoyed the hymns with the familiar tunes, as On Jordan’s Stormy Banks, When I Can Read My Title Clear, Rock of Ages, Silent Night. I don’t know why sermons at Christmas are necessary. 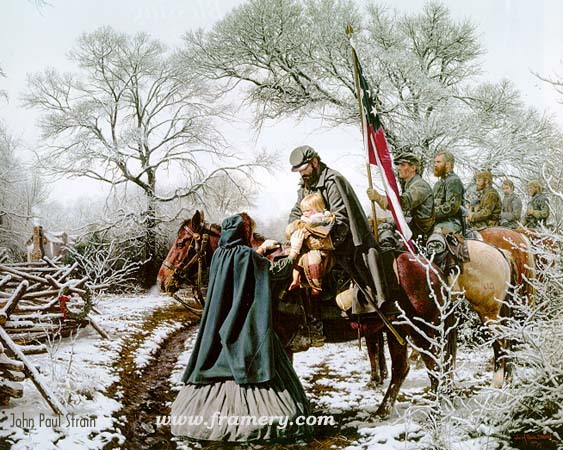 Bible reading and hymn singing are sufficient – in time of war perhaps more meaning ful than sermons. I am truly sorry that I cannot spend Christmas in Yazoo…Perhaps I could get something more palatable to eat than corn bread, or pleasant to drink that muddy water. I am sure the visit would be a pleasant one if I could get neither. I would love the visit on account of the society. The presence of some of my friends would be both meat and drink to me. We all went down last night to see the tree and how pretty it looked. The room was full of ladies and children and Cap. gave us music on the piano and tried to do all he could to make us enjoy ourselves and we did have a merry time. All came home perfectly satisfied. This has ben a cold dark day but we all went down to see how the tree looked in the day time but it was not as pretty as at night. December 27th. Santa Claus got here at last. Several boxes for W.L.A. arrived today with eatables and other good things sent by those at home to let us know that though we are far from them they still remember us. Many blessings from Him be upon those loved ones at home. May this be the last Christmas that I spend away from your side! It is a sad Christmas; cold, and threatening snow. My two youngest children, however, have decked the parlor with evergreens, crosses, stars, etc. 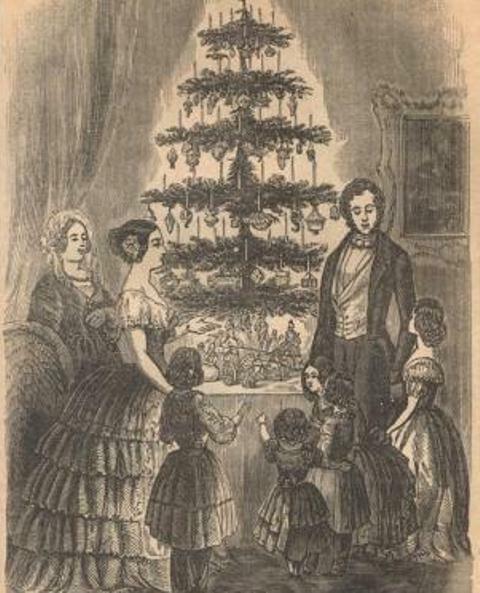 They have a cedar Christmas-tree, but it is not burdened. Candy is held at $8 per pound. My two sons rose at 5 A.M. and repaired to the canal to meet their sister Anne, who has been teaching Latin and French in the country; but she was not among the passengers, and this has cast a shade of disappointment over the family. A few pistols and crackers are fired by the boys in the streets—and only a few. I am alone; all the rest being at church. It would not be safe to leave the house unoccupied. Robberies and murders are daily perpetrated. I shall have no turkey to-day, and do not covet one. It is no time for feasting. This is Christmas Day. The sun shines feebly through a thin cloud, the air is mild and pleasant, [and] a gentle breeze is making music through the leaves of the lofty pines that stand near our bivouac. All is quiet and still, and that very stillness recalls some sad and painful thoughts. This day, one year ago, how many thousand families, gay and joyous, celebrating Merry Christmas, drinking health to absent members of their family, and sending upon the wings of love and affection long, deep, and sincere wishes for their safe return to the loving ones at home, but today are clad in the deepest mourning in memory to some lost and loved member of their circle. If all the dead (those killed since the war began) could be heaped in one pile and all the wounded be gathered together in one group, the pale faces of the dead and the groans of the wounded would send such a thrill of horror through the hearts of the originators of this war that their very souls would rack with such pain that they would prefer being dead and in torment than to stand before God with such terrible crimes blackening their characters. Add to this the cries and wailings of the mourners – mothers and fathers weeping for their sons, sisters for their brothers, wives for their husbands, and daughters for their fathers – [and] how deep would be the convictions of their consciences. Yet they do not seem to think of the affliction and distress they are scattering broadcast over the land. When will this war end? Will another Christmas roll around and find us all wintering in camp? Oh! That peace may soon be restored to our young but dearly beloved country and that we may all meet again in happiness. While on the subject of Christmas cheer I will mention a toothsome delicacy which had a ready sale. It was ginger bread, or ginger cakes. An enterprising squad had gone into the business of baking. They had built an oven on a hill over against our camp and secured some baking pans about three feet square. They bought flour and bacon from the commissary, bought a lot of sorghum molasses in the country, and got the grease they needed by frying it out of the bacon. 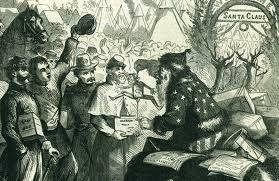 They had numerous customers, who bought and criticized freely; but as I had been paid $840, seven months wages, all the Confederacy ever paid me, I concluded to invest some of my wealth in ginger cakes. I had a good many one-dollar Confederate bills. They were red-backed and about six inches by three in length and breadth. I remembered boyhood days when the old cake man came to town on court days with his basket of cakes and five cents would buy a square eight or nine inches by six inches, and I supposed that one of my dollars, or at most two, would buy half of what the big baking pan contained. But when I handed him my dollar, saying “Give the worth of that,” he just laid the bill on the big square of cake and cut out the size of it and gave it to me for my money. I was so surprised that I did not object, but took my little piece of cake and went away sorrowing that our currency had sunk so low as to be measured in terms of gingerbread. The following excerpt is from my novel, A Beautiful Glittering Lie. 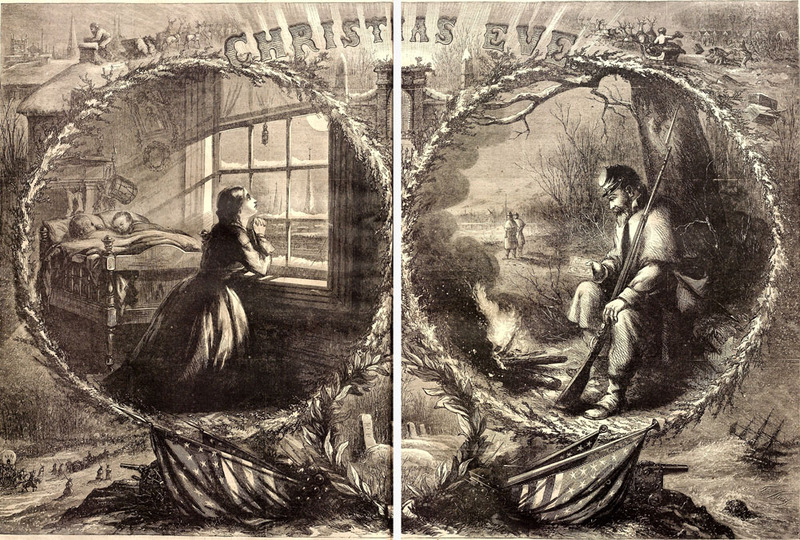 It takes place during the Christmas season, but in 1862, Christmas was anything but joyous. The following morning, David and his family attended church, where they received a grand reception, for the congregation had heard about Hiram’s homecoming, and bestowed well-wishes upon them. That afternoon, David busied himself by getting caught up on chores he had let slide over the past few months. He wanted his father to be proud and impressed with his efforts to take care of the place, just like he had promised. Even though it was the Sabbath, a designated day of rest, he worked through it anyway, reasoning that he had only four days to finish his tasks. The next few days were filled with anticipation and last-minute preparations for Christmas. While the girls decorated, David worked diligently to finish his handmade gifts, and Caroline cooked. The family spent every waking moment getting ready to receive their loved one. Soon, it was the day before Christmas. David awoke to discover that it was drizzling, which wasn’t unusual for that time of year. Pulling himself from his warm bed, he dressed, ate a quick bowl of grits, and went outside to tend to the livestock. By the time he had finished, he was cold and damp, so he returned to his room, changed, and sat down on the bed with his guitar. Although he hadn’t played it in quite a while, he decided to learn a few carols, so he practiced “Oh Come All Ye Faithful” and “Silent Night” several times. While he worked out the chords to the “Boar’s Head Carol,” he heard a knock at his door. Josie entered, wearing a brown coat over her green calico dress. “Ma says it’s time to go fetch the tree!” she announced, barely containing her excitement. Throwing on his coat and hat, he followed her outside to the barn. He saddled Renegade, gave her a foot up, and led the colt out toward the woodlot. Noticing that it had stopped drizzling, he clucked to Renegade, who responded by prancing. “He’s like this every day!” she exclaimed, bouncing atop the colt. Renegade slowed to a walk as brother and sister approached the woods. “Reckon tonight ole Santee Claus will be makin’ his appearance,” David remarked casually. To their amusement, Renegade blew in response. Caleb and Si came loping up, eager to find out what they were missing, and the two hounds nearly tumbled over each other in their rush. Josie laughed at them. “Let’s find the purtiest tree out here for Pa,” she suggested. “That’s a right good idea.” He grinned up at his sister, who smiled back down at him.